Seventh in the series of World Tour Highlights articles, this dispatch lists my ten favourite buildings around the world, in no particular order. I don’t pretend to make these judgments based on any architectural merit - they’re chosen based purely on my own aesthetics and the mood I was in at the time. It’s not a building, since Trinity College – like most universities – is a collection of many buildings; and besides, it’s only one room in one building among those many that I fell in love with – but the Long Room in Trinity College Library is one of my favourite places in the world. Warm wood floorboards worn smooth as glass, bookshelves with sliding ladders two stories tall and filled with ancient leather-bound volumes, and carved busts of scholars from past ages down the length of the central aisle; the atmosphere of collected knowledge is strong enough to taste. 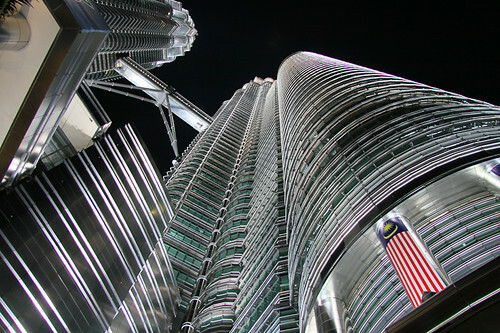 These buildings (and Kuala Lumpur itself) first came to my attention because of the debate they sparked in Toronto over the the claim to the title of the world’s tallest building (or tower, or free-standing structure, or whatever). They’re truly massive constructions, all in fluted brushed stainless-steel cladding like 1930’s Futurist rocket ships ready for launch, joined halfway up by a bridge. Visible from anywhere in the city, they’re a clear statement of Malaysia’s optimism and forward momentum, though the urban gossip surrounding their construction mirrors the struggle of the Southeast Asian nation’s struggle against elements of its own government. Across the street from the Palacio Congreso, at the Western end of Buenos Aires’ famous Avenida de Mayo with all its wonderful architecture, is the remarkable and unremarked Confitería el Molino – the Windmill Cake Shop. It’s a prosaic name for a fascinating building. It’s never really discussed in any of the city’s tourist literature, and most Porteños seem not to notice it much. 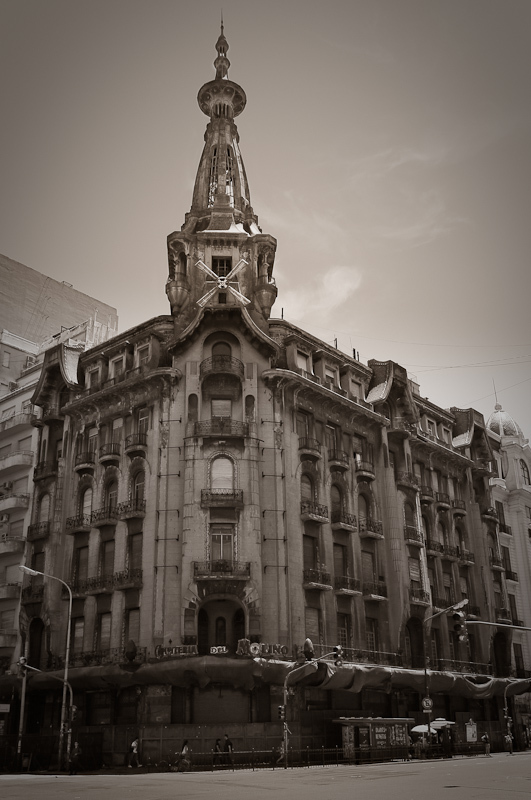 It’s six stories of stained tan stone, ornate carvings and wrought-iron balcony railings, topped with a beautiful example of Buenos Aires’ iconic architectural flourish, an elongated Italianate cupola with open sides that expose a central spiral staircase. The base of the corner turret that supports the cupola is decorated with the eponymous windmill sails. I’ve never been inside – the building is derelict and has been boarded up for fifteen years. When I first saw it I thought that a building so wonderful must have a story behind it – but if so, I can’t find it. It’s just one elegant building among many, as far as the city’s inhabitants are concerned. Neuschwanstein Castle, as Sheryl and I got very tired of being told every five seconds, is the castle that so impressed Mr. Walt Disney that he animated it and turned it into his iconic, trademarked own. Despite its unsavoury associations, it really is a beautiful pile of stone. It’s the quintessential High Romantic fairy-tale castle, all slender spires and fluttering pennons. It overlooks the countryside from its perch above a gorge, complete with a delicate bridge spanning a rushing torrent far below – perfect for dramatic confrontations between the noble hero and the arch-villain. 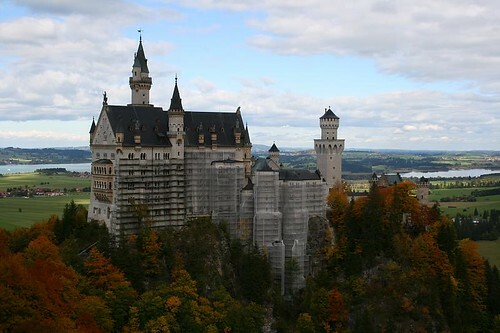 It was built and obsessively project-managed by Mad King Ludwig II of Bavaria in the late 19th century. Its most picturesque elevation was covered in scaffolding when we visited, naturally – this has been a recurring theme during our travels. The Quinta da Regaleira is a historical estate in Sintra built and designed by the extremely eccentric, possibly mad, and definitely wealthy merchant Antònio Augusto Carvalho Monteiro, a gentleman scholar with a mystical and alchemical bent. 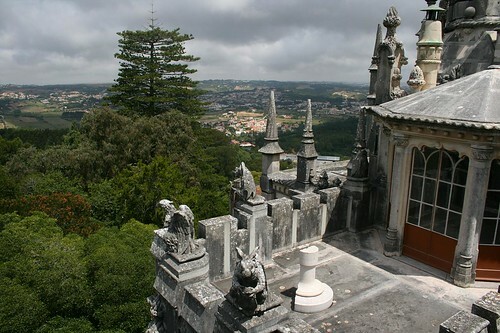 It’s an extravagant five-story mansion in the neo-Manueline style, covered with a profusion of Gothic gargoyles, towers and ornamented spires. Inside there are strangely-shaped rooms, elaborate fittings, a laboratory and stone spiral staircases leading to the roof. The roof itself has fantastic angles and terraces that can only be accessed by secret passages. I could have spent days there. A very odd building indeed. 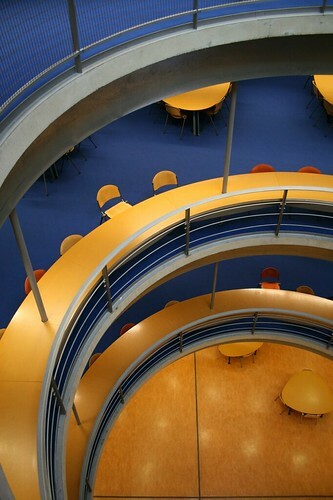 Built half-underground on the university’s Mekelpark campus, the roof of the building is a grassy hill. The wedge-shaped building’s single exterior wall is glass, and stacked with bookshelves from floor to the height of four stories. Poking up out of the grass on the hill roof is a massive silvery cone that pierces down through the hill and into the open space of the library, conducting light and air from outside, and the upper, interior levels of the cone are ringed with study tables. A marvelously strange building which is still somehow perfectly suited to its purpose. 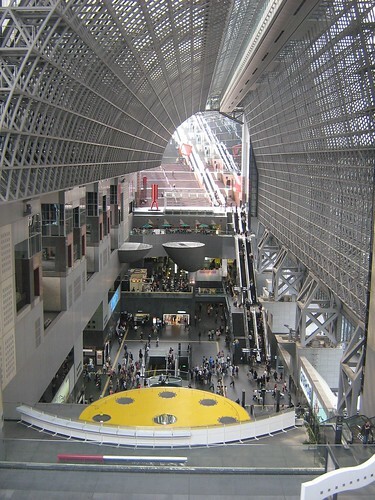 Kyoto’s central station is an enormous steel and glass cavern. One vast space inside, with nine stories of escalators to either side of the atrium up to the fluid, rippling lines of the roof observation deck and the catwalk slung across the interior gulf fifteen stories below. The blatantly futuristic design is in direct opposition to Kyoto’s traditional wooden construction and ancient temples, but quirky decor touches, like a huge Astroboy statue and the cubic offices overhanging the atrium, save the colossal building from is own grandiosity. Walking away from Himeji’s train station, the castle suddenly appears like magic on top of a little hill overlooking the city. It’s one of the loveliest, most elegant buildings I’ve ever seen. 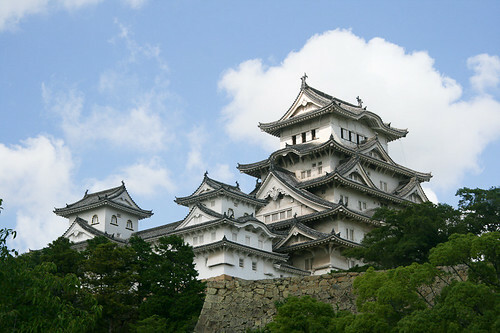 The building is called the “White Heron” castle for its gleaming pale walls and the upswept wing-like shapes of the pagoda-style stacked roofs, each one smaller than the one below. The roof tiles are all in silver-grey and they shine like pewter in the sun. I found it a very moving building, very striking but harmonious with its environment. The castle is not without its dark side, however; one of the outbuildings was marked as the designated area for ritual suicide of dishonoured samurai, and according to legend the ghost of a betrayed serving girl haunts the well of the castle grounds. reasons I went there, actually – to see in person the buildings I’d seen in textbooks. The Battló house didn’t disappoint. Although a restoration and not built from the ground up, Gaudí designed every bit of it from the windows to the doorknobs. 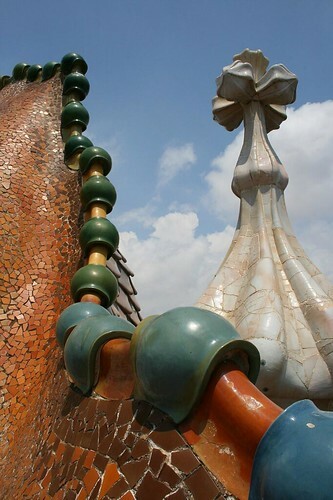 Organic forms dominate as in all of Gaudí’s work; the banister of the main staircase is twisted wood, and the building’s facade is decorated with undulating skeletal balconies and oval windows. The roof-line, famously, is dominated by a humped dragon shape in mosaic tile; some say the building is an architectural allegory of St. George’s slaying of the dragon. The top floor is taken up by uncharacteristic – for Gaudí, at least – white rooms and hallways of pure white parabolic arches. An entirely fascinating building in every way. I spent an entire afternoon there and I don’t think I took in half the intricate detail. It’s a terrible cliché, to go on and on about how amazing the Taj Mahal is. And yet… some things are clichéd for good reasons. The Taj is without question the most heartbreakingly beautiful building I’ve ever seen. Postcard photos and films don’t do it any justice – you need to see it in person. Right away. Go, now. When you get there, preferably just after sunrise, you’ll understand. You’ll see how the vaulting of the arches is exactly the right proportion to make the great dome seem light enough to float above the paved square around it. You’ll see the reflective, sparkling flakes of mineral embedded in the creamy white stone of the walls, that give such depth and sense of motion as you walk around it. And you’ll see the detail and intricacy of the inlay work running up the building, forming geometric patterns, flowers, and the letters of the suras of the Quran. You’ll notice, despite the crowds surrounding it even at that early hour of the day, how the building evokes a stillness of the heart and a calm joyfulness of the spirit. Go, now. 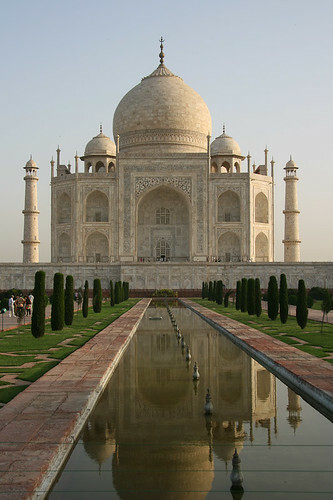 *pant pant* just got back from the taj mahal….you’re right! I sense that you are engaging in sarcasm, sir.